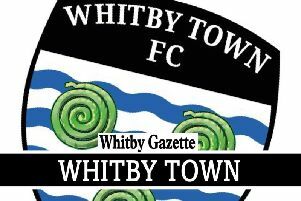 Whitby Town are back in Evo-Stik Premier Division action on Saturday when they travel to Mickleover. Picture: Brian Murfield. Whitby Town travel to Mickleover Sports on Saturday, aiming to bounce back from the disappointment of last weekend’s FA Trophy exit at the hands of Blyth Spartans. The Blues currently sit third from bottom of the Evo-Stik Premier Division table, five points from safety, and manager Darren Williams has stated that now is the time for his side to put a run of results together. “It’s going to be tough going there but the lads need to start pushing themselves harder, taking their chances and winning games. Mickleover, who were promoted from Evo-Stik Division One South last season, currently sit four places and seven points above the Seasiders. “Mickleover aren’t that far ahead of us in the league, but they’ve gone to Salford City and drawn in midweek, which is a good result,” Williams added. “It’s a perfect example of what this league is like, there are a lot of good teams and anyone can beat anyone. Williams is hoping to make a couple of additions to his squad in time for the journey to Derbyshire, but is still waiting to get the deals over the line. “We’re close to bringing a couple of lads in, but nothing is confirmed yet. It comes down to finances and we’re just waiting to see if we can finalise the deals.” he said. The Blues are running a supporters’ coach to Mickleover. It departs the Turnbull Ground at 9.15am on Saturday. Call Graham Manser on 07966 241344 to book a place. The two sides will meet again just seven days later, when Whitby host Sports on November 28 following a fixture re-shuffle. The Seasiders were originally due to entertain Buxton on that date, but the game was postponed due to the Bucks’ involvement in the FA Trophy. The Blues looked set to be without a fixture, but will now contest the second part of a double-header against Mickleover. Whitby Town FC are planning to start hosting walking football sessions, if there is sufficient interest. Anyone who would like to take part should contact Manser on the above number.